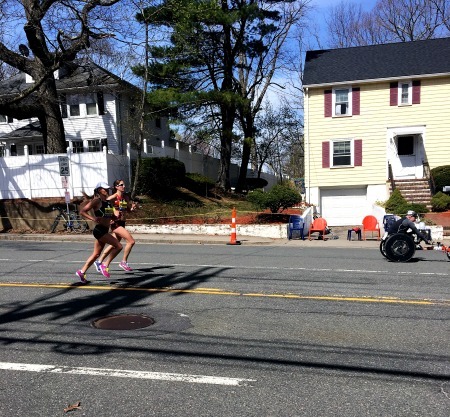 Spectating the Boston Marathon + An Announcement! Well at this point we are one week removed from the Boston Marathon, but I am still slightly awestruck from the experience of watching the marathon this year. It’s interesting because at this point, marathons and races are nothing new to me. I’ve always said I love the excitement and joy of a race atmosphere. Boston is on a whole different level. 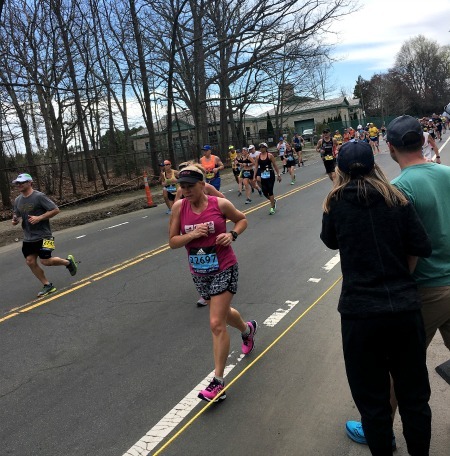 Around 9:30 in the morning on Marathon Monday, I met up with my coach and a couple of her friends to head out to mile 18 to spectate and cheer on the other McKirdy Trained athletes participating in the race. Already at 9:30 in the morning, it was HOT – probably in the 60s and bright and sunny. Pretty nice for spectating but not at all good for running a marathon. We got off the subway close to Mile 16 in the race and were just in time to watch the elite women breeze by us. You could tell they were working hard but they still looked FAST. The crowds lining both sides of the streets erupted in cheers every time one of these women passed. Shortly thereafter came the elite men. We saw the lead pack with Galen Rupp and a bunch of others cruising right along. 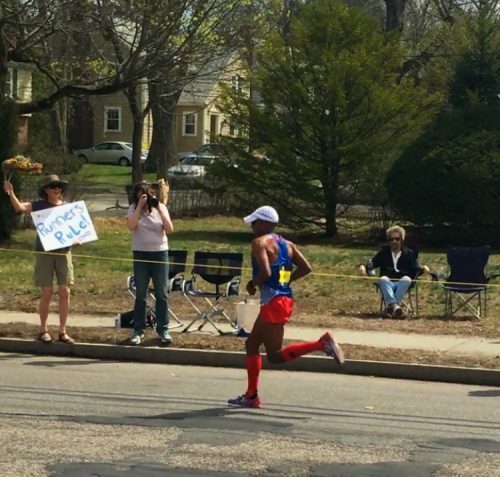 A minute or two behind them was Meb! We cheered for him like no other and I was so excited to get some good pictures. His stride looked so powerful, I was in awe. We continued on our way, walking to just before mile 19 on the course. I knew Boston was huge on spectators, but still, it was something to experience, seeing the course lined with spectators on both sides so far outside of downtown Boston. There was also a much more relaxed vibe out on this part of the course. There was still plenty of security but there weren’t security checkpoints at every corner, which made it way easier to get around. People had set up tents and/or picnics outside their homes, kids were running around, and the whole thing just felt like one big, epic block party (one that just happened to be bisected by a marathon). As we continued on, we saw a McKirdy Trained athlete coming our way who we immediately started cheering for. She saw us and stumbled toward Mary, clearly not in good shape. Just as she reached us at the side of the road, she toppled over onto the ground. Mary and her friend immediately scooped her up, protecting her from being trampled by the steady flow of runners behind her. Someone ran over and gave us a water bottle which we gave to her, and then she insisted on continuing on her way, despite assurances that she could stop and get some help. It was honestly a little scary and really hit home how tough the conditions on the course were. Finally, we got to our prime viewing area just before Mile 19. By this point, the elites were passed and more of the ‘average’ runners were passing in a steady stream. I had so much fun cheering for all the runners and listening to the funny cheers and comments from the group standing near us. It was hilarious how many runners ended up striking up conversation with those guys as they ran past! Last year, I had gotten caught up in the chaos of trying to find my way to the hotel my running club hosts an after-party at right by the finish. Crowds of people, security checkpoints, and general pandemonium had me so stressed out I was hardly able to enjoy the marathon. It was so different this year and so nice to actually be able to spectate and enjoy the race. I would highly recommend the stretch of Mile 16-18 to anyone looking to spectate along the Boston Marathon! This entry was posted in Uncategorized and tagged Boston, Boston Marathon 2017, BQ, Marathons, Philadelphia Marathon. Bookmark the permalink. Your excitement pulses from this entry. Good luck with your goals. Woohooo i like this announcement! 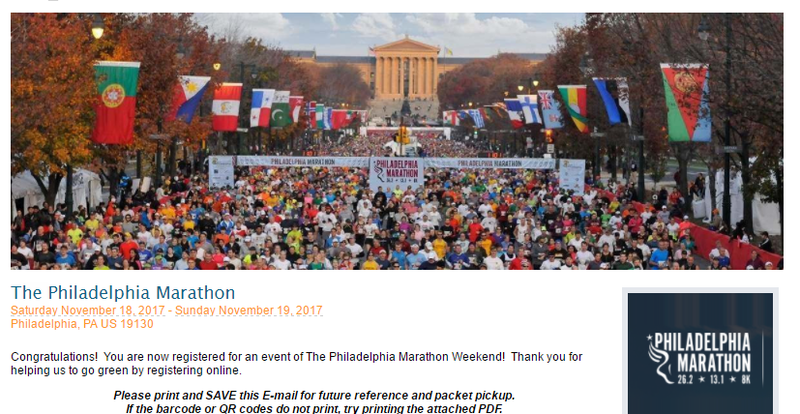 I am also looking to BQ at Philly this year! Was trying to BQ for 2018 at the Eugene Marathon in 2 weeks, alas was struck with hamstring tendonitis so that plan was derailed. But may try the new Beantown Marathon (Hingham) in September for 2018 BQ. YOU CAN DO IT!